The State Water Resources Control Board voted to abandon its formula — decried by some local agencies as a "one-size-fits-all" model — which required each water district to curb water use by a certain state-mandated percentage and instead, let districts determine how much they should save. Some see the switch as premature. "I think it’s really important that we make sure to convey a consistent message that we are still in an emergency drought situation," said Tracy Quinn, a senior policy analyst with the Natural Resources Defense Council. Quinn and a handful of others argued against the change at Wednesday's State Water Board hearing in Sacramento. Nearly two-thirds of the state is still classified by federal climatologists as being in "severe drought." But board chair Felicia Marcus says the state is not giving up its oversight role. "We also get to watch," Marcus told KQED. "It’s kind of a trust-but-verify situation that I think is worth considering." It won't be a free-for-all. Under the new system, local suppliers need to apply prescribed hypothetical "stress tests." Their savings targets will then be based on anticipated water shortfalls over the next three years — assuming the next three mimic the last three in terms of water demand and drought conditions. "We’re making a shift that recognizes the supply conditions have improved," said the water board's Max Gomberg. "We’re setting up something that is going to be in place, really, for the future." The board says it's partially reacting to more than 150 comments it received. In a last-minute reversal, the board did decide to keep the ban on restaurants serving water unless customers ask for it. As much as local water officials resisted them, the emergency system of state-imposed quotas largely worked. Over Governor Jerry Brown's declared nine-month drought emergency, from June 2015 to February 2016, urban consumers saved 1.19 million acre-feet of water, compared to 2013. That's enough to supply nearly 6 million people for a year, and fell just short of the governor's 25 percent goal. Among the state's 411 largest water districts, 199 or just under half, met or exceeded their cumulative goals. Standouts included Cambria Community Services District, Menlo Park, Dublin San Ramon Services, Soquel Creek Water District and Santa Barbara — each saved 20 percent more water than state regulators required. There were also stories of redemption among local utilities that initially fell short, but eventually saved more than required. The ways in which they turned things around are widely disparate and relied on a combination of deliberate tactics and good fortune. In the agricultural communities served by the Rainbow Municipal Water District in San Diego County, many farmers switched from growing avocados to less water-intensive grapes. They also got lucky. San Diego County saw baseball games rained out by freak downpours last summer. "The majority of the rain came from the remnants of Hurricane Dolores and suppressed demands for all of our customers," says District analyst Cynthia Gray. For Atwater, a San Joaquin Valley town of about 29,000, the solution came in the form of community volunteers. Two police volunteers and one designated "water cop" issued warnings and notices while they were out on their routes. The water cop was none other than Atwater's former mayor Greg Olzack. The retiree donned a uniform and a city badge while driving around in a police vehicle four to five times a week looking for water wasters, often starting before dawn. “People ask why I get up so early and I say, 'it’s like fishing, that’s when they are biting,'" says Olzack. Atwater banned watering altogether on certain days and between 7 a.m. and 7 p.m. on others. 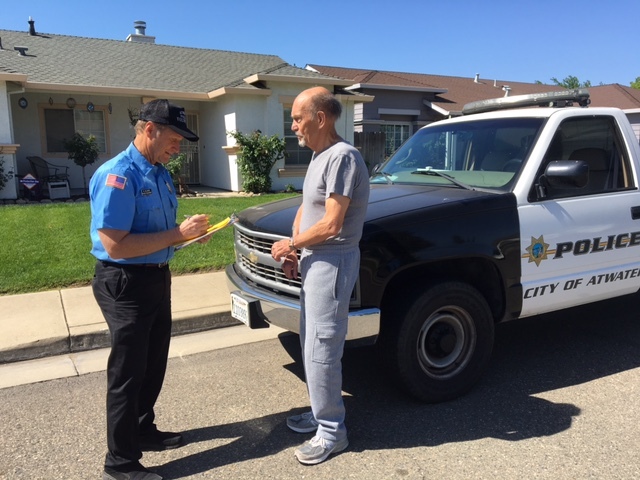 Olzack and his crew issued 850 citations from July to October, for over-watering or watering on the wrong day. 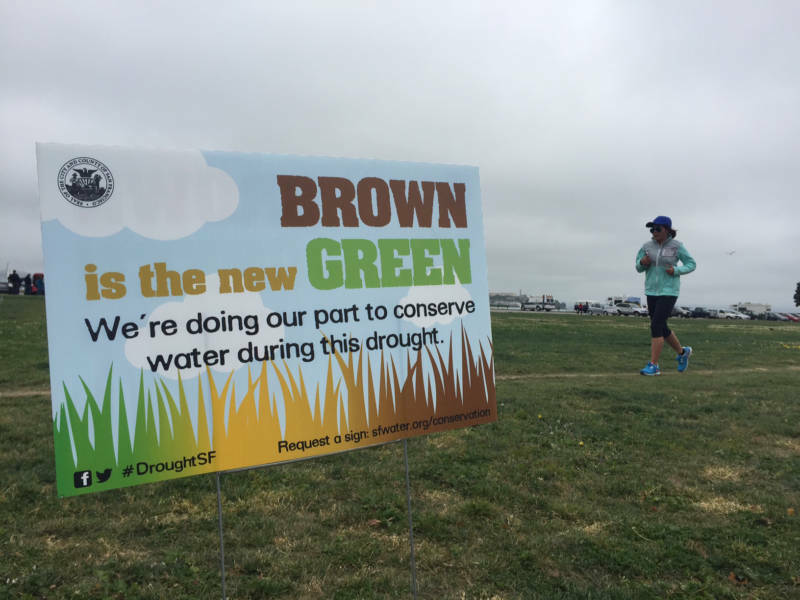 Larger water agencies such as Santa Cruz and the Oakland-based East Bay Municipal Utilities District used similar strategies, but began lifting water restrictions as soon as the state announced its intent to revise the rules last week. Water agencies face a fundamental conflict in conservation; their revenues are based on how much water they sell. The more their customers conserve, the harder it hits the utilities' bottom line. Some of the "least improved" water districts — those that met their targets in June and then slipped off the wagon — did so despite issuing thousands of fines. In December, Vacaville issued 1,950 penalties for residents that used more than their assigned residential allocations, and added an extra 25 percent excessive consumption penalty to the customers' bills. The city started off on the right foot, exceeding its goal by nearly 4 percent in June, but by February its cumulative savings had dropped to 13 percent below its goal. Vacaville Utilities manager Ramiro Jimenez says limiting lawn watering in the summer was easier for residents than trying to squeeze water use in winter. "By then you’re relying more on indoor savings," says Jimenez. "When you ask people to use less indoors, like not washing dishes or clothes as often, it becomes tough for people to make that shift — it becomes a lifestyle change." Calexico, a border town in Imperial County that lost its conservation momentum over time, blames its shortage on reporting inaccuracies. Officials there say it switched to "smart" meters with software that wasn't fully operational, and so had to estimate water use. Neither of these "least improved" districts used tougher measures like public shaming or prohibiting new swimming pools from using potable water. Questioned by KQED, several districts whose conservation performance declined the most over time cited extenuating circumstances. Despite the mixed results, it's clear that the system of enforceable state-imposed water restrictions resulted in substantial savings over all. It's equally unclear what lifting these requirements will mean for long-term conservation in drought-prone California.